It's the near future, and the world is on the brink of war. The paths of two lonely teens converge, caught in an uncontrollable current crashing through time and space. Rowan and Ophelia discover that they share a place they thought was the stuff of childhood dreams. In Antilia, there is magic, and humans walk alongside minor gods and mythological beings. But all is not what it seems, and the two are pulled inexorably into a divided realm. Separated and unable to get home, they find that Antilia's fate and Earth's are forged together. Can Ophelia and Rowan repair the damage, fulfill their destinies, and save both worlds from annihilation? 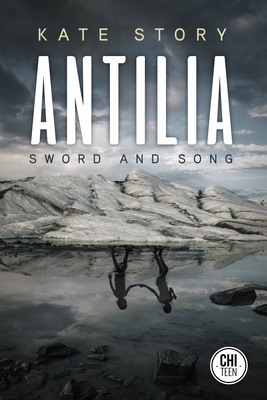 Antilia: Sword and Song is an epic story of survival and self-discovery. Kate Story is a writer and performer. A Newfoundlander living in Ontario, her first novel Blasted (Killick Press) received the Sunburst Award's honourable mention for Canadian Literature of the Fantastic. She received the 2015 Ontario Arts Foundation's K.M. Hunter Award for her work in theatre. Recent publications include short stories published by Tor Books, Stone Skin Press, and Exile. Her story "Demoted" was featured in CZP's Imaginarium: Best Canadian Speculative Writing 2015. Her first novel, This Insubstantial Pageant, is out with ChiZine in Fall 2017.